One of the major factors in the recent US presidential elections were the email leaks of Hillary Clinton’s campaign manager John Podesta, which signaled the weak cyber security measures. Now, Donald Trump is himself a target of popular hacktivist group Anonymous. Anonymous doesn’t have much affection for the United States President Donald Trump. Given the absurd policies of Trump, this stance shouldn’t surprise anyone. The hackers have published a little guide on Twitter, telling how to hack Donald Trump’s smartphone. 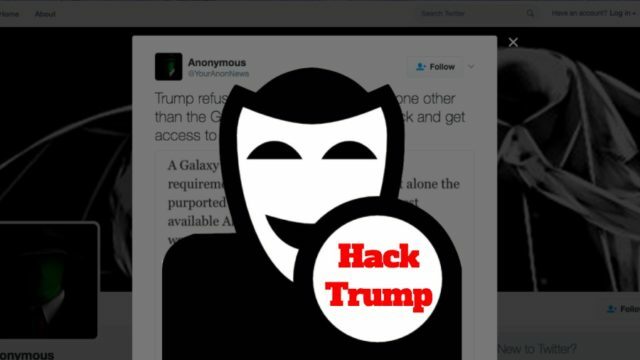 In the tweet, Anonymous mentioned a popular Android exploit that could potentially do the job of cracking Donald Trump’s smartphone. It says that a Galaxy S3, which runs Android 4.4, doesn’t even meet the security requirements of an average teenager. The group insists that using Stagefright, one can easily hack Galaxy S3 by “enticing Trump to click on a link.” To use Stagefright exploit to hack Trump’s phone, a hacker will need to make him download a crafted MMS containing a .MP4 file. It should be noted that, in all likelihood, since taking office, Trump has been using a Samsung Galaxy S3 Phone. Many media reports have also noted that the standard Galaxy S3 received its last security update about 2 years ago. Thus, as Anonymous points out, it might be vulnerable to Stagefright.